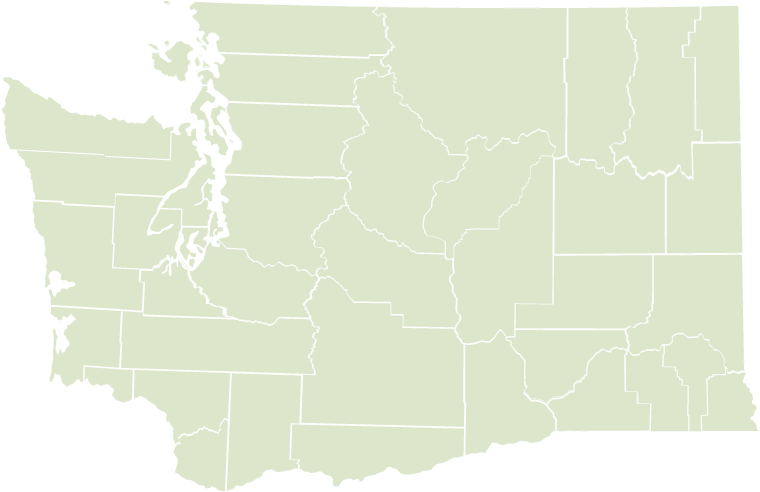 The Washington Health Alliance was formed in 2004 as the Puget Sound Health Alliance. Motivated by the desire to stem the rising cost of health coverage for public employees, then-King County Executive Ron Sims was the driving force behind its formation, which came about through recommendations from King County’s Health Advisory Task Force. This task force brought together Dr. Ed Wagner from the MacColl Institute, Dr. Alvin Thompson from the University of Washington and benefits representatives from purchasers, providers and academic experts to reduce the misuse of care and improve quality, rather than cut benefits or shift costs to King County employees and their families. Sims was joined by Margaret Stanley, who became the Alliance’s first executive director. Margaret Stanley is hired as the Alliance’s first executive director. First Board of Directors meeting is held. Clinical Improvement Teams formed to focus on five health conditions: heart disease, diabetes, low back pain, depression and pharmaceuticals. The first All-Alliance meeting is held. 80 organizations are members by the end of the year. The Alliance adopts the Institute of Medicine’s framework for performance measurement and reporting. The Alliance calls for hospitals and physician clinics to bar pharmaceutical sales representatives from visiting doctors and distributing free samples and other marketing items. The Alliance becomes one of the first communities named by Robert Wood Johnson Foundation as part of its Aligning Forces for Quality initiative. US Health & Human Services Secretary Michael Leavitt designates the Alliance as the nation’s first Community Leader for Value-driven Health Care. The Alliance announces agreements with 16 area health plans and purchasers to supply data to create the region’s first public report on the quality of health care provided in local clinics. The Robert Wood Johnson Foundation holds its first annual Aligning Forces for Quality meeting in Seattle, bringing together representatives from 14 communities around the country. Two more Clinical Improvement Teams develop recommendations on new focus areas: asthma and prevention. The first Community Checkup report is released. The report has results for 14 volunteer medical groups and is based on data reflecting care provided to more than 1.6 million patients in the Puget Sound region. Mary McWilliams is named executive director of the Alliance. The Alliance announces a second three-year grant to participate in the Robert Wood Johnson Foundation’s Aligning Forces for Quality project. The second Community Checkup report is released showing results for 46 medical groups with more than 170 clinics across Puget Sound, plus results for 30 hospitals. The Alliance begins participating in eValue8™, a tool from the National Business Coalition on Health that allows purchasers to evaluate health plans based on national standards. The Alliance launches the first website that allows people to search and compare health care performance data for both Puget Sound clinics and hospitals. The Alliance develops data supplier specific reports. The Alliance begins reporting quality of care measures for Medicaid patients. The third Community Checkup report builds on previous versions and this time includes smaller medical groups and clinics, with three additional data suppliers and three additional measures. The Alliance establishes a Purchaser Affinity Group to support purchasers as they develop their benefit design strategies and to allow members to share information. 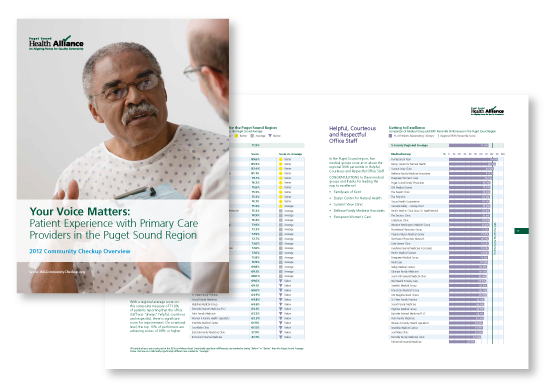 The 2010 Community Checkup is released and reveals that variation in the quality of health care delivery is a significant issue in the Puget Sound region. The Alliance Board adopts as its five-year vision that providers in the region will be among the top 10 percent of performers nationally in the delivery of quality care, resulting in a reduction in waste and the cost of health care. The Clinical Performance Improvement Network (CPIN) is launched in partnership with the Washington Academy of Family Physicians and the Washington State Medical Association. The Alliance and the Health Care Authority launch the Multi-Payer Medical Home Reimbursement Pilot. The pilot includes seven health plans and 12 clinics, and is supported by a grant from the Robert Wood Johnson Foundation. 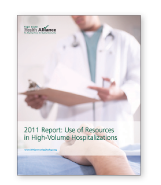 The Alliance publishes the 2011 Report: Use of Resources in High-Volume Hospitalizations as an additional step toward reporting on value. The fifth Community Checkup report is released, building on previous versions and giving a sense of progress over time. Teaming with King County, the Alliance unveils Own Your Health, a new campaign for employers to help empower consumers to become active participants in their own health and health care. The Alliance launches Spotlight on Improvement, an ongoing series of case studies highlighting real stories of health care quality improvement. The Alliance publishes its Report on Generic Drug Prescribing, which shows variation in prescribing patterns between and even within medical groups in the Puget Sound region. The Alliance publishes the results of the region’s first comprehensive survey of patients’ experience with their primary care providers – a report called Your Voice Matters. The Alliance Board identifies reducing the cost of health care as its top strategic priority. 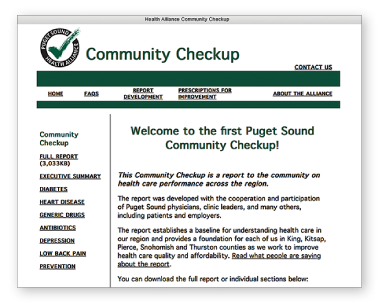 The Alliance publishes the sixth Community Checkup and launches a robust new website, which includes a searchable database that compares the performance of Puget Sound area medical groups, clinics and hospitals, and also includes expanded information and resources. The Alliance receives a two-year grant from the ABIM Foundation to promote the Choosing Wisely® campaign in Washington state. The Alliance publishes a report for purchasers and plans called the Voluntary Aggregate Price Variation Study, which finds differences of 40 percent or more are common among delivery systems for the cost of select hospitalizations in the five-county region. Washington state is awarded a $3.4 million federal grant and partners with the Alliance to establish a data center to improve health care transparency in the state. The inaugural Disparities in Care 2013 Report helps providers who serve the Medicaid population better understand potential disparities within their practice. The Puget Sound Health Alliance changes its name to the Washington Health Alliance to reflect its statewide orientation and makes the decision to expand measurement and reporting of health care quality and value beyond the Puget Sound region. The 2013 Community Checkup results are made available, and include county-level results for all 39 counties in the state for the first time. The Washington state legislature passes legislation to establish the principle of an All-Payer Claims Database (APCD). The Alliance facilitates work groups tasked with recommending measures for the state’s first core measure set on health care quality and cost to the Performance Measures Coordinating Committee appointed by Governor Jay Inslee. The Alliance publishes its second patient experience survey Your Voice Matters report, this time including Medicaid patients. Nancy A. Giunto is named the new executive director of the Alliance. 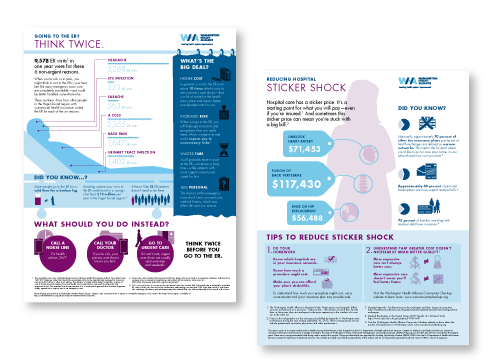 The Alliance releases a new report, Hospital Sticker Shock: A Report on Hospital Price Variation in Washington State, which finds that price variations from 200 to 400 percent and more are common. The Alliance releases Less Waste, Less Harm: Choosing Wisely in Washington State, the first report in the nation to measure Choosing Wisely® recommendations at the state-level, with county-by-county results for nine different recommendations. The Alliance joins a broad coalition of business leaders, health care providers, health plans and community groups supporting the implementation of a fully functioning and sustainable All-Payer Claims Database to reduce costs and improve quality through better transparency. More than 180 organizations are now a part of the Alliance. The Alliance releases its first reports on hospital readmissions, avoidable emergency room use and medical procedure rate variation, indicating potential overuse of health care services in Washington state. The eighth version of the Community Checkup results are made available and include detailed results for three new counties: Skagit, Spokane and Whatcom. The Alliance continues its statewide expansion efforts.